Have some dare devils in the digs? Head to Wake Nation & ride the waves. Wakeboard, water ski, kneeboard & wakeskate on a 10-acre lake, without a boat! 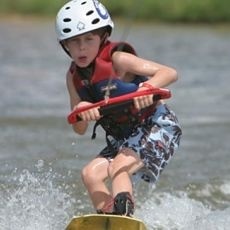 Wake Nation Cincinnati is the first and only cable wake park in the tri-state (Ohio, Kentucky, Indiana) area. Our park allows both beginners and experienced riders the ability to wakeboard, water ski, kneeboard, and/or wake skate on our 10-acre lake ALL WITHOUT a boat! You don't even need your own equipment to ride. You're welcome to bring and use your own equipment or you can just come in your bathing suit because we've got everything else you need on site.